The Giza Criminal Court acquitted on Thursday former Interior Minister Habib al-Adly of graft charges amounting to 181 million Egyptian pounds, paving the way for his release from custody. A decision to seize the funds of Adly, his wife, his son and his daughters was also revoked. 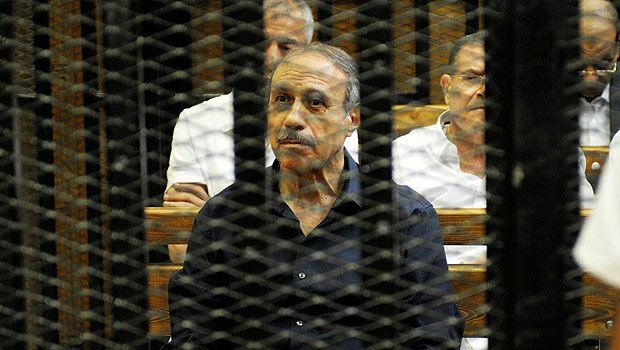 Adly was referred to court after investigations revealed he had amassed a fortune disproportionate to his sources of income, indicating that he may have used his political influence for illegal gains. The court was scheduled to issue its verdict last week, yet Adly’s defence team called for reopening the proceedings to present new evidence which they said could acquit their client. Like several of former President Hosni Mubarak’s top officials, Adly faced several charges after Mubarak’s removal in February 2011. The former interior minister was taken into custody days after Mubarak’s removal and has since faced a total of four trials. However, of the four trials he has faced, Adly has only been served a ratified sentence in one. He was handed a three year sentence, which was upheld in February 2014, for exploiting conscripts by tasking them with carrying out work for him in his home. Essam al-Batawi, Adly’s lawyer, had earlier told Aswat Masriya that his client has already served his three-year prison sentence, which could see his release from custody if the court acquits him in the case at hand. Another member of Adly’s defence team, Waguih Abdel Malak, said on Thursday that they are now seeking a document from the public prosecution to authenticate his release. A Cairo court acquitted on February 24 Adly and former Prime Minister Ahmed Nazif of charges of wasting 92 million Egyptian pounds of public funds through irregularly procuring vehicle license plates. Last November, the former minister was acquitted of charges of inciting and aiding the killing of protesters, in a trial that included Mubarak. He was also acquitted of profiteering by a Cairo court last June.